Stewart Welch and, from left, Fire Chief Chris Mullins and Police Chief Ted Cook. Oden served as mayor for 20 years before retiring last year. Journal photo by Jordan Wald. As former Mountain Brook Mayor Terry Oden stood next to a plaque bearing his name on the morning of Oct. 13, he joined a league of a very few men. 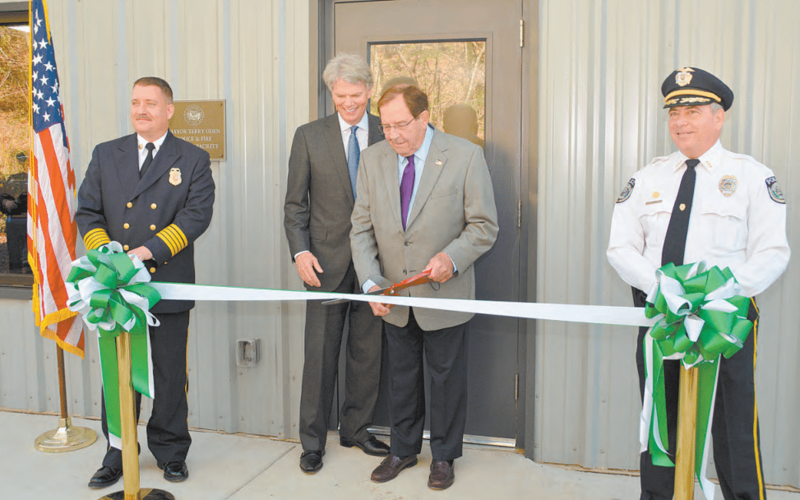 The plaque is on a joint training facility recently constructed for Mountain Brook’s police and fire departments. 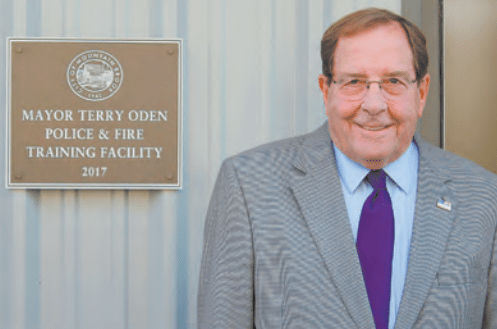 The decision to name the facility the Mayor Terry Oden Police and Fire Training Facility was a unanimous one, said Mayor Stewart Welch, and marks Oden’s place as the city’s longest-serving mayor. But naming a building in honor of someone is something the city rarely does. “In fact, they never do it,” Oden joked. “I guess this puts me in a league with Emmett O’Neal and Dr. Charles Mason,” for whom the city’s library and Board of Education building are named. Welch said the unusual honor was warranted. “I cannot think of a more appropriate person to dedicate this building to than Mayor Terry Oden,” Welch said. Oden served as mayor for 20 years before retiring last year. He was a champion of the public safety departments and served as chairman of the Jefferson County Emergency Management Agency. Oden remarked that public safety had “always been a part of my life in one way or another.” That’s partly because he spent 25 years as a member of the Secret Service, and partly that his father was a Birmingham firefighter. The building is located on East Street, at the edge of Cahaba Heights near Rathmell Park and the city’s Public Works Department. The field had been used for training, but there was no running water on the site, Welch said. So, whenever there was a training session, they would have to bus in porta-potties and take in bags of ice. Having a training facility was essential for the city, according to both Police Chief Ted Cook and Fire Chief Chris Mullins. “It didn’t make sense not to share a building,” said Cook, adding that the fire and police departments have a stellar working relationship. The facility includes a heated and air-conditioned building for classes, a firing range and a Fire Department drill field with a laddered tower for climbing drills. When it came down to whom the building would be dedicated to, it made sense to honor Oden, under whose leadership the project originally began, Cook said.